At Muvi we provide you the facility to do any kind of customization to your online video platform. You can add a new payment gateway of your choice, customize your website template, add a new feature and many more. You can do all these customization by paying a custom fee in the form of DevHours (Development Hours). For any customization, first you need to purchase DevHours and then you need to add a ticket for customization. 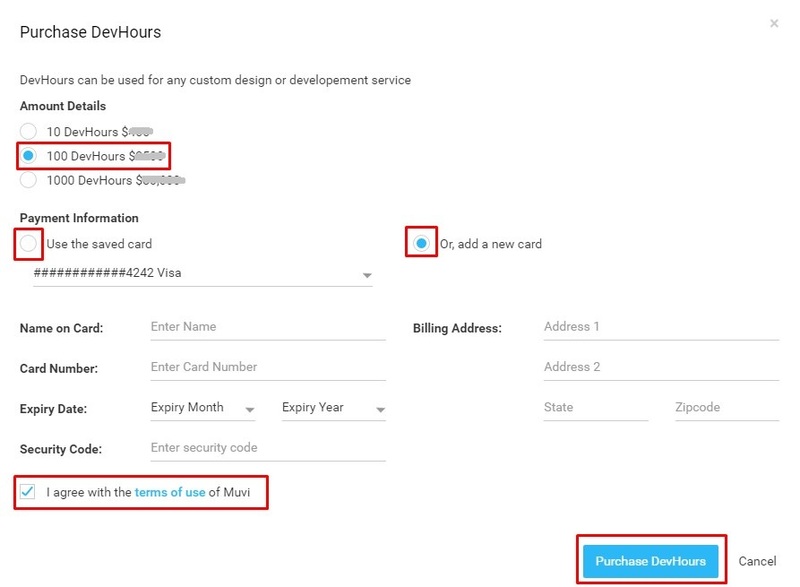 We will charge the required DevHours from your purchased DevHours. Then you need to approve it from the CMS. Once you approved the DevHours, it will be deducted from your existing DevHours and show you the remaining balance. 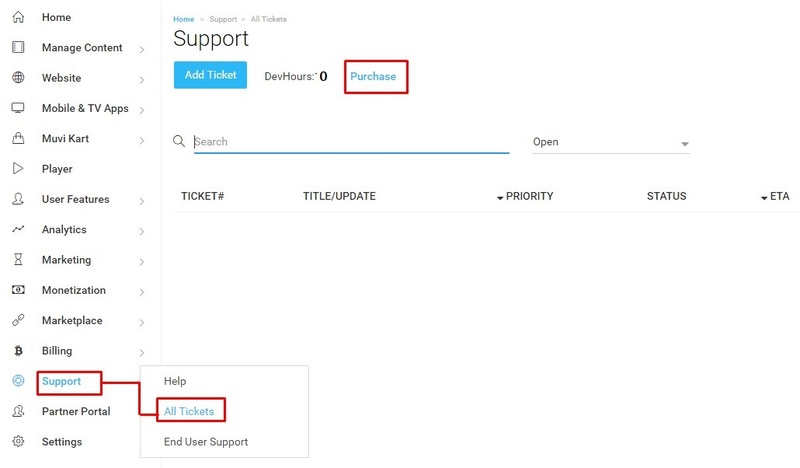 To purchase DevHours, please go to “Support” --> “All Tickets” in your CMS. Click on “Purchase” as shown in the below screenshot. Once you clicked on “Purchase”, you will get a pop-up about different DevHours to purchase with amount details and the payment procedure. • Now your purchased DevHours will be displayed like the below screenshot. After purchasing DevHours, you need to add a support ticket for customization. Then we will charge the required DevHours from your main balance. You will get an approval request in your CMS. Then you need to click on “Approve” to allow us use the DevHours. (See Below Screenshot) Here we have charged 60 DevHours for customization. After your approval, your DevHours will be shown like the below screenshot. Here you have paid 60 DevHours (Out of 100) for support ticket #1420. The status has changed from “Approve” to “Approved”. Note: Please discuss with Muvi representative before paying a DevHour. There is no refund once DevHours is paid for ticket.